You ever look at someone and just instinctively know they thpeak with an adorable lithp? As one of the last of the elusive Woodland Goblins, the relic master Thistlethorn has dedicated himself to preserving the history of Mythoss. Fascinated with ancient weapons and artifacts from an early age, he has always had a predilection for spotting and acquiring the most precious of objects. Now serving Queen Artemyss Silverchord, Thistlethorn is the guardian of Castle Silverhorn's greatest treasures including the Silverchord, a sacred weapon inherited by Artemyss to aid in her fight against the emerging evils seeking to corrupt all of Mythoss. Wow, guess we should have reviewed Queen Artemyss first, for as often as she's mentioned in this bio. Also, it's interesting to note that, as a Woodland Goblin, Thistlethorn is somehow related to the Bog Goblin - distantly, perhaps, but related nonetheless. Goblins is goblins is goblins! While the Bog Goblin was some kind of frog-thing, Thistlethorn is more of a... catfish squirrel? Otter rat? His small head is fuzzy, with a ridge of longer fur running over the top like a mohawk. His beady black eyes are set very wide, and he's got a squarish muzzle with a very thin nose, while his ears stick way out sideways and come to tufted little points at the end. Thistlethorn uses the new slender boy-body developed for Series 2, with the angular armor on the chest. The arms are shorter than the "full-sized" figures' are, but they still end up looking slightkly too long on this figure: like he's weirdly gangly; the legs feel much more proportional. The loincloth is the scale mail style, though smaller than usual to better fit this toy. The shapes of the armor are the same seen on the larger characters, just scaled down to his size. 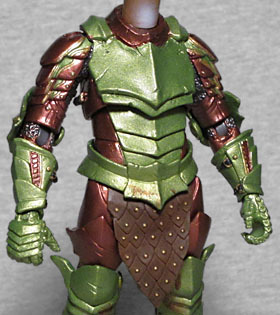 The armor is painted bronze and pale green, colors that absolutely suit a member of Xylona's Flock. The paint is shiny, so we know he's wearing metal and not simply carefully carved wood (something that needs to be clarified when you're talking about a forest-dweller). The scale mail looks like actual leather flaps that've been bradded together. 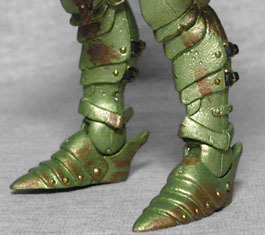 Each area of color has accents of the other - green stripes on the bronze, and bronze stripes on the green - and the boots and greaves have splotches on them that make it look like he's been tromping around in the mud. Cute! His fur is brown, getting lighter on his snout and throat, and darker on his faux hawk (plus he's got stripes on his cheeks). The colors of his fur were brighter on the prototype, but this suits him just fine. Using a smaller body does not mean Thistlethorn has less articulation. 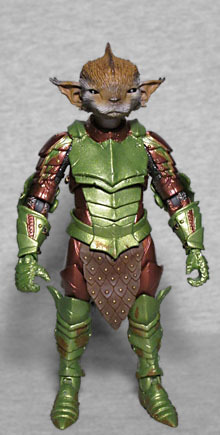 Like the average Mythic Legions toys, he features a balljointed head, swivel neck, swivel/hinge shoulders and elbows, swivel forearms, swivel/hinge wrists, balljointed torso, swivel/hinge hips, swivel thighs, swivel/hinge knees, and swivel/hinge/swivel ankles. Seeing as Thistlethorn is the keeper of the royal junk, it's nice that one of the stretch goals for this Kickstarter was handing out interesting weapons to everyone - it wouldn't do for him to just come with a standard strap, sword, and shoulder armor, would it? Of course not! 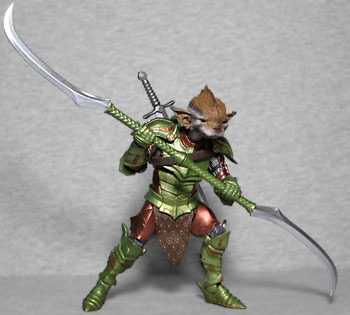 So in addition to those, he was also given the bladed staff from the Elf Weapons pack, the same that Xylona had, though the green here matches his armor and the blades are silver. But the truly cool thing was planned to be with him from the start - the Sword Horsemen. Presumably one of the "artifacts from an early age" of Mythoss, this 6¼" tall blade takes the Four Horsemen's stylized horse-skull logo and reimagines it as part of the hilt. 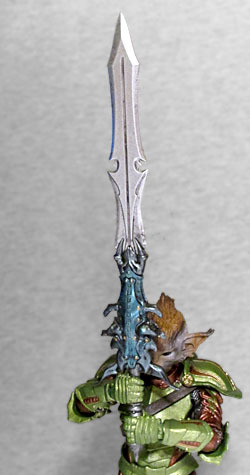 It's a fun piece of design work, and is half the reason I included Thistlethorn in my pledge: I wanted that sword! (Of course, now I have two of them). Thistlethorn adds some nice variety to the Mythic Legions lineup. The line can have frightful skeletons and vampires, but also something as cute and pettable as this little guy. And because the Four Horsemen know what they're doing, the figures still look shared parts of a cohesive world.